Some Hindus believe that Harihara is the Supreme God. 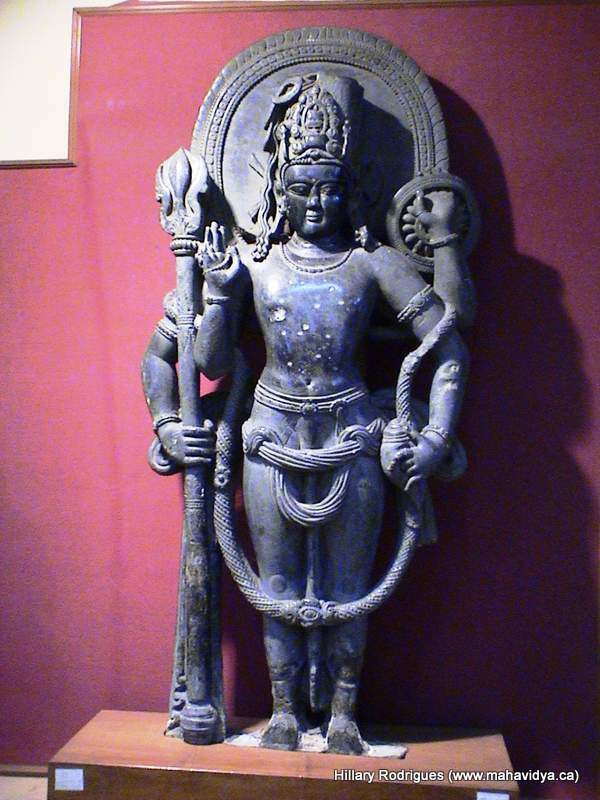 In the Hindu tradition the supreme gods are Visnu and Siva. Visnu is known as Hari and Siva is known as Hara. In Sanskrit Hari means a yellowish or khaki color, which represents the sun and the Soma plant. Put together Hari and Hara are Harihara, which is a combination of the two gods. Harihara is also commonly known as Shankaranarayana; “Shankara” is Siva while “Narayana” is Visnu. Devotees believe that Siva and Visnu are different aspects of the same reality. Sometimes they are thought to have been brought together because they were ‘rivals’ but there is no evidence to show that this is the case. Harihara is occasionally used in philosophical terms to indicate Visnu and Sivas unification of different aspects of the Supreme God (Olson). The most famous philosophical analogy is the yogurt and milk analogy, which says that yogurt is a groundwork of milk but yogurt cannot be used as milk. Siva is an expansion of Krishna but Siva cannot act as Krishna. Also Siva has a connection with the material world while Visnu and Krishna do not. It is thought that Visnu is a part of Krishna as the whole. Harihara was very popular in Cambodia in the beginning of the seventh century. It is thought to be popular in Cambodia because previous Cambodian rulers had worshiped Siva in the seventh and eighth century. The rulers tried to maintain and control southern Cambodia, which had a strong connection to Visnu. The northern rulers wanted an icon that would represent the unification of the south and north, which lead to Harihara. Evidence of Harihara worship was most commonly found deity during the seventh century in the Preangkorian Khmer empire (see Lavy 22-31). Archaeological evidence relates to clay Harihara figurines, which suggest that Harihara was the main deity being worshiped in seventh century Cambodia. The worship of Harihara did not spread to India or Southeast Asia until many centuries later. The worship of Harihara began to die out of the Khmer culture in the thirteenth century. Temple for worship of Harihara are very rare. One of the main temples for worship is in Shankaranarayana village. Shankaranarayana is located east of Kundapura in Karnataka, India. The village gets its name from the temple. The temple is thought to be one of the Seven Wonders of the World that was created by Maharshi Parashurama (Meister 167-170). The main festival for Shankaranarayana is the Shankaranaraya Jaatre. The festival begins four days before Makar Sankranti, and celebrates the sun passing from one zodiac sign to another, and runs for a week. The first six days of the event consist of a variety of rituals devoted to Harihara. The last day of the festival is the main event, when Rathotsava is celebrated. This occasion frequently falls on January 16. At the Rathotsava festival, more then ten thousand people from different parts of India come to worship (Meister 170-173). When Harihara is depicted with four arms, the right side is shown as Siva while the left side is Visnu. Siva is portrayed as being the destroyer and in his right upper hand holds a trident; the points on the tridents are believed to represent trinities for example, past, present, and future or creation, maintenance and destruction. Some people also believe that it represents the three channels of energy or nadis. The right side of the head of Harihara consists of Siva’s matted locks with a headdress. Siva’s third eye is visible on the right side of the forehead as well. On the left side of Harihara Visnu is shown calm and holding in his upper left hand the wheel emblem; his head is also portrayed with a crown; the crown represents Visnus’ supreme authority while the wheel represents the circle of life, unity, the sun, and reincarnation (Lavy 21). Although not widely known, Harihara is a significant and interesting deity within the Hindu tradition. Lavy, Paul A. (2003) Journal of Southeast Asia Studies: “As in heaven, so on earth: the politics of Visnu, Siva and Harihara images in Preangkorian Khmer civilization.” Cambridge: Cambridge University Press. Meister, Michael A. (1976), Artibus Asiae. Vol. 38, Artibus Asiae Publishers. Olson, Carl (2007) Hindu Primary Sources. New Jersey: Rutgers University Press. Article written by: Rose Naigus (April 2010) who is solely responsible for its content.